The Pozzi's are a fifth generation winemaking family. Originally from Cremona, in Northern Italy, our great grandfather became well known throughout the province for his wine business. His horse-drawn wagons traveled over undeveloped, country roads carrying barrels of the best wines from different regions of Italy. Grandfather Pozzi did well – especially with the wines he found in Sicily. In 2006 we realized a generation-old family dream to make our own Sicilian wines, and Villa Pozzi was born. 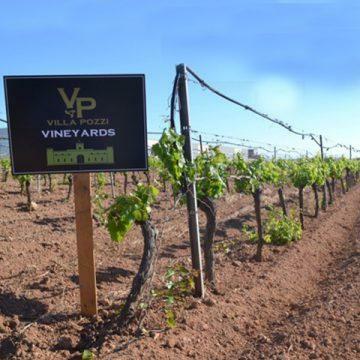 Using only superior quality grapes and controlled production, our wines follow our family motto of Res non Verba – Deeds, Not Words. Daniele Pozzi, our family's fourth-generation winemaker, continues to catapult the inspiring legacy and tradition of our family wine business into the future. “Villa Pozzi's Pinot Grigio is fermented in temperature-controlled stainless steel tanks to ensure a fresh, fruity, and crisp wine. It showcases aromas of lemon, white peach, and pear. It’s clean and well balanced with bright acidity, and the finish lingers with notes of stone fruit and flowers.